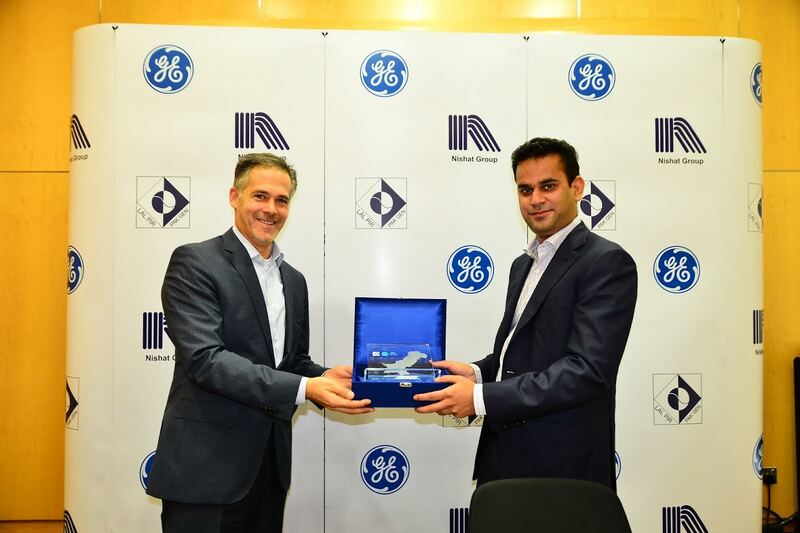 Hassan Mansha (right), Director & Chairman of the Board of Directors of Lalpir Power Ltd. and Pakgen Power Ltd. and Joe Anis, President & CEO of GE’s Power Services business in the Middle East and Africa, at the ceremony to sign agreements whereby GE will provide its advanced digital industrial software solutions to Lalpir Power Ltd and Pakgen Power Ltd.
Karachi: GE (NYSE: GE) signed agreements to provide advanced digital industrial software solutions to Lalpir Power Ltd. and Pakgen Power Ltd., operators of Nishat Group’s thermal power plants located in Mehmood Kot near Muzaffargarh, in Pakistan. Each facility has a capacity of 365 megawatts (MW), and the new contracts signal the continuing adoption of software within Pakistan’s power sector, including for plants equipped with non-GE steam turbines and generators. The agreements were signed at a ceremony in Dubai by Hassan Mansha, Director and Chairman of the Board of Directors of Lalpir Power Ltd. and Pakgen Power Ltd. and Joe Anis, President & CEO of GE’s Power Services business in the Middle East and Africa. The software solutions provided by this agreement will further the Government of Pakistan’s goals under Vision 2025 to provide uninterrupted and affordable electricity, and increase electricity access from 67% to over 90% of the population. Powered by Predix, GE’s operating system for the Industrial Internet, GE’s Digital Power Plant includes a suite of software solutions that can enable Lalpir and Pakgen to visualize plant performance, analyze and monitor operations in real time and help identify maintenance issues before they occur, leading to greater asset uptime and reduced unplanned downtime. GE estimates there is US$1.3 trillion in value creation between now and 2025 for companies that are going digital, and US$90 billion is expected to be invested in the energy industry’s digitization by 2020. Lalpir and Pakgen operate the largest steam turbines deployed in Pakistan. The agreements with them also underscore GE’s enhanced capabilities and comprehensive experience of technologies developed by other original equipment manufacturers (oOEM) in the thermal power sector, after its acquisition of Alstom’s energy portfolio in 2015. Lalpir Power Ltd. and Pakgen Power Ltd. are a part of the Nishat Group of companies, one of the region’s leading and most diverse business groups with commercial interests in the finance, insurance, cement, textile, paper, power, dairy, hospitality and aviation sectors amongst others in Pakistan. The Group has an asset base exceeding US$10 billion and has played a vital role in the industrial development of Pakistan in terms of contributions to the national exchequer, job generation and textiles exports. GE has been a long term partner in Pakistan’s progress for more than 50 years, creating over 400 employment opportunities in the country. Today, GE-built technologies generate more than 25% of Pakistan’s electricity, while GE and its joint venture partners power more than 60% of the aircraft operated by Pakistani commercial carriers and GE Healthcare devices are installed in more than 70% of large hospitals across the country. Lalpir Power Limited was incorporated in Pakistan on 8th May 1994 under the Companies Ordinance 1984. The principal activities of the company are to own, operate and maintain an oil fired power station having gross capacity of 362MV in Mehmood Kot, Muzaffarghar, Punjab, Pakistan. The shares of the company are listed on Karachi Stock Exchange (Guarantee) Limited and Lahore Stock Exchange (Guarantee) Limited. The organization makes concerted efforts to balance its commitment to the country’s energy needs while minimizing environmental impacts on land, air and water. Pakgen Power Limited was incorporated in Pakistan on 22 June 1995 under the Companies Ordinance, 1984. The principal activities of the Company are to own, operate and maintain an oil fired power station having gross capacity of 365 MW in Mehmood Kot, Muzaffargarh, Punjab, Pakistan.